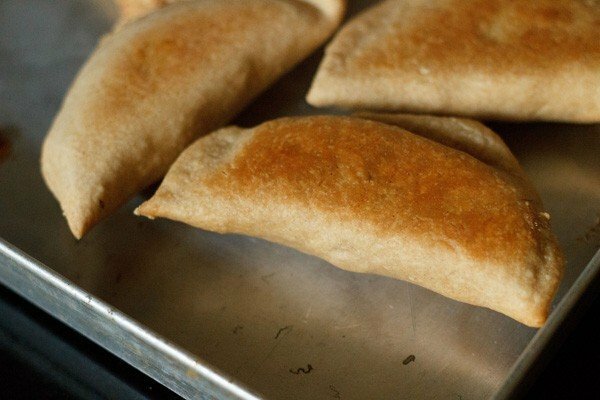 this crisp and flaky gujiya is made with khoya or mawa. 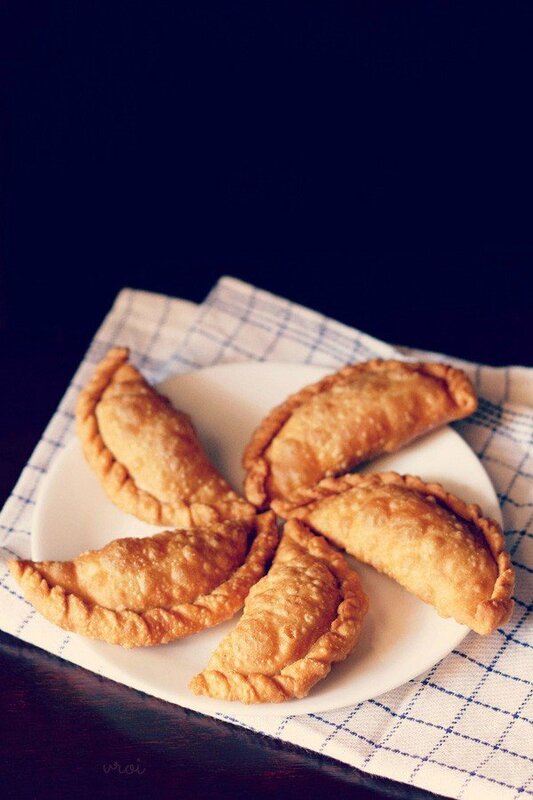 gujiya is a popular north indian sweet of a crisp, flaky pastry filled with a sweet khoya and dry fruits stuffing. 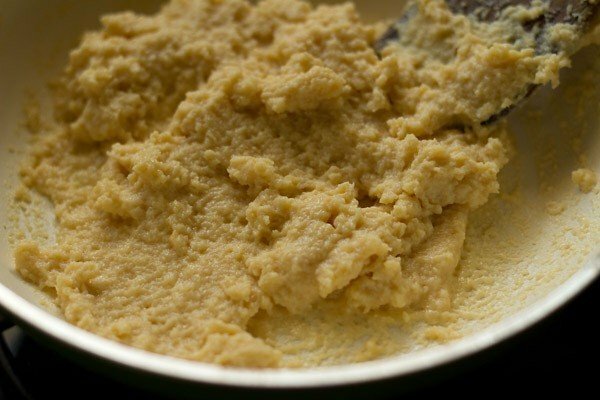 khoya or mawa is evaporated milk solids. 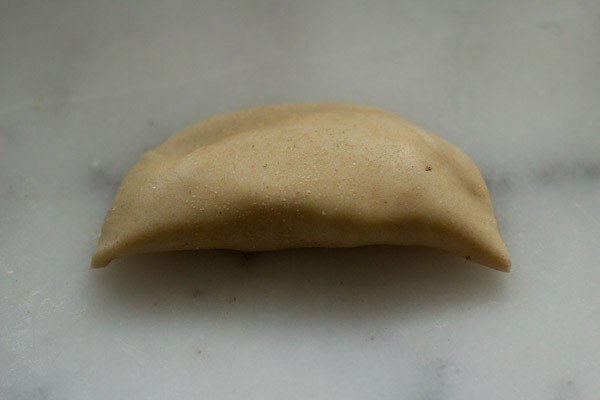 gujiya recipe with step by step pics – crisp, flaky and tasty gujiya made with a sweet mawa (khoya) and dry fruits filling. 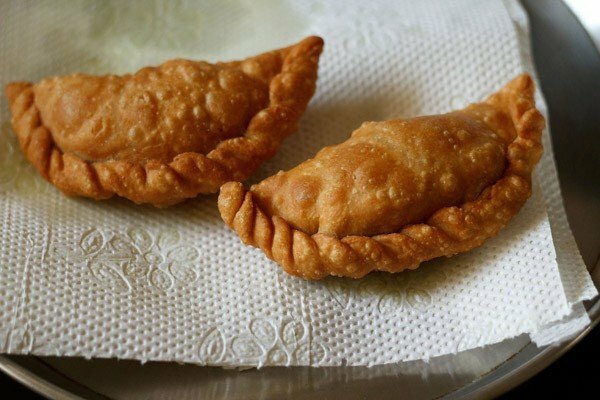 in this post, i am sharing both fried and baked version of making gujiya. so you can choose your pick. 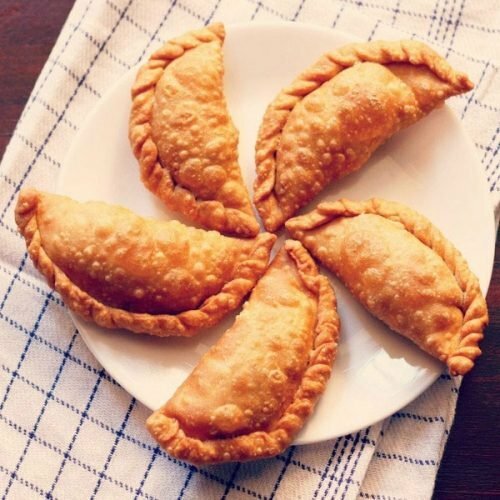 gujiya is a deep fried pastry stuffed with a sweet filling of khoya. 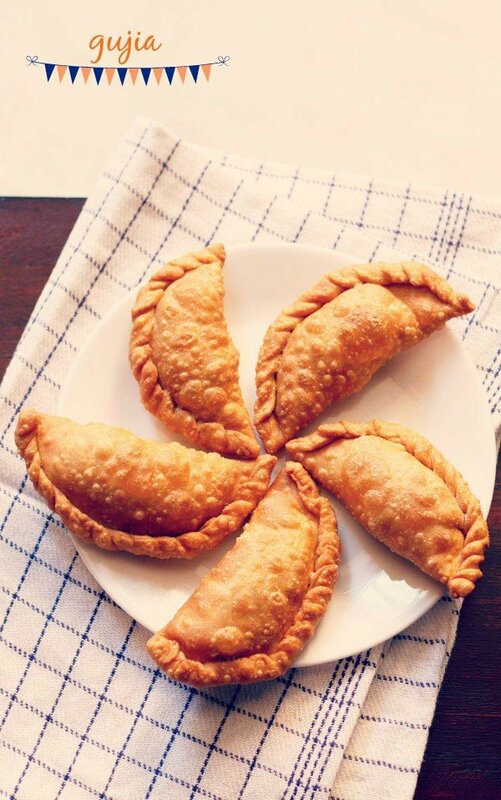 gujiya do resemble empanadas and very much popular in north india, especially during holi festival. its not they are made only during holi. they are also made during diwali. this time i did not want to make karanji and hence made these gujiya. both karanji and gujiya are similar sweets, except for the stuffing. karanji which is popular in maharashtra has a stuffing of coconut, poppy seeds, sesame seeds and dry fruits. 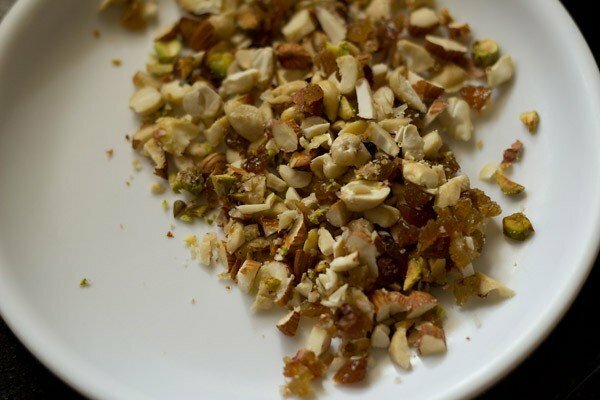 whereas guijiya has a stuffing of khoya with dry fruits. in some variations desiccated coconut is also added. but i do not add coconut to the khoya stuffing. usually the outer pastry is made of all purpose flour. but you can even make from whole wheat flour. in this recipe, i have added half-half of both the flours. 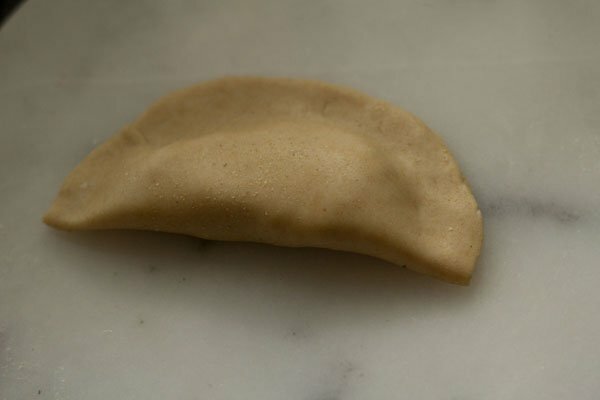 i baked some gujiya and fried the rest and have illustrated both the baking and fried methods in the step by step pics. texture and taste wise the fried gujiya are definitely much better. however for health reasons and to cut down on the fat you can easily bake these gujiya. mawa gujiya is served plain. once they are cooled, then keep them in air-tight box and they stay well for some days. ½ teaspoon cardamom powder (choti elaichi powder) OR 6 to 7 green cardamoms powdered in a small coffee grinder or a mortar-pestle. take the all purpose flour, whole wheat flour and salt in a bowl. 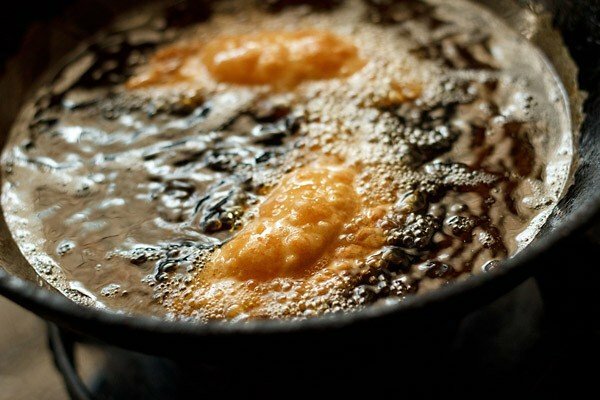 heat ghee in a small pan or bowl. pour the ghee on the flours. rub the ghee with the flours, with your fingertips to form a bread crumb like texture. then add water in parts and begin to knead. 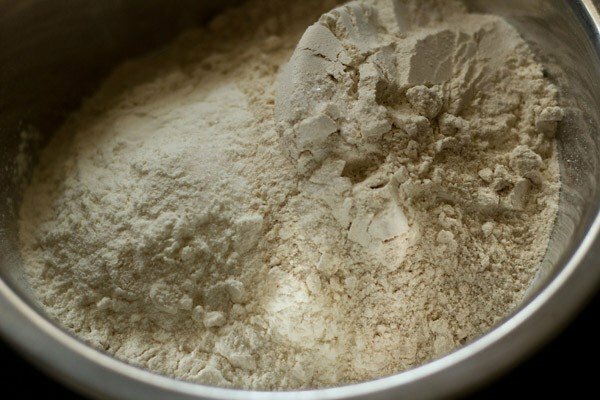 the amount of water needed will depend on the quality and texture of the flour. knead the dough till firm. cover the dough with a moist cloth and keep aside for 30 minutes. 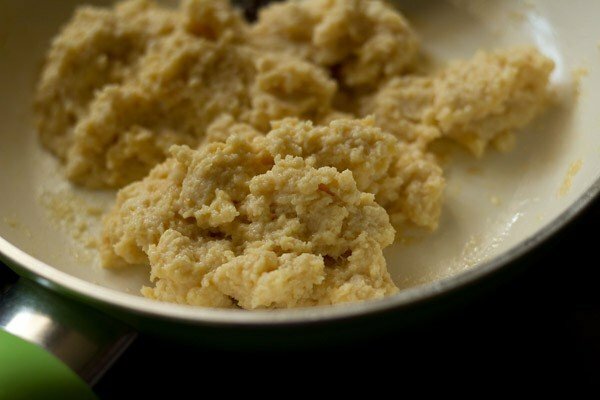 melt ½ tbsp ghee in a pan on a low flame. add the crumbled or grated khoya. stir the khoya continuously on a low heat. cook the khoya, till it begins to gather around itself. switch off the flame and keep the pan down. 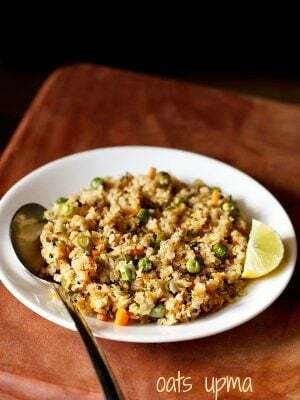 let the khoya stuffing cool down completely. then add powdered sugar, chop dry fruits and cardamom powder. better to seive the powdered sugar if there are lumps. mix everything well and keep the stuffing aside. check the taste and add more sugar if you prefer. dust the rolling board lightly with some flour. roll each ball with the rolling pin to a small circle having 4 to 5 inches diameter. don't add too much flour while rolling. if you can roll without the flour, then it is better. with your fingertip, apply water all over the circumference edge. 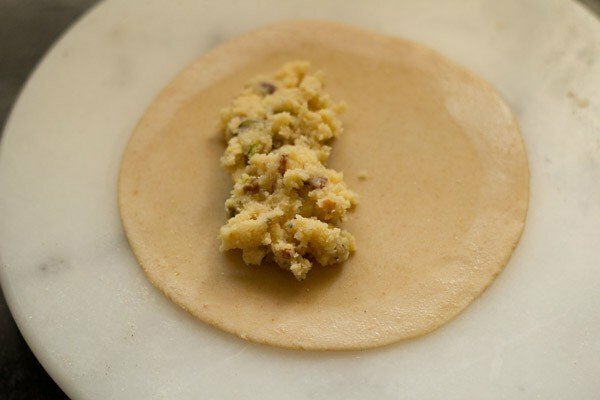 place about 1 tbsp or 1.5 tbsp of the khoya filling on one side of the circle, keeping edges empty. don’t add too much of stuffing as then its difficult to shape them and the gujiya may break in the oil. carefully, bring together both the edges and join. gently press the edges. with a small gujiya cutter or pizza cutter, trim the extra edges. 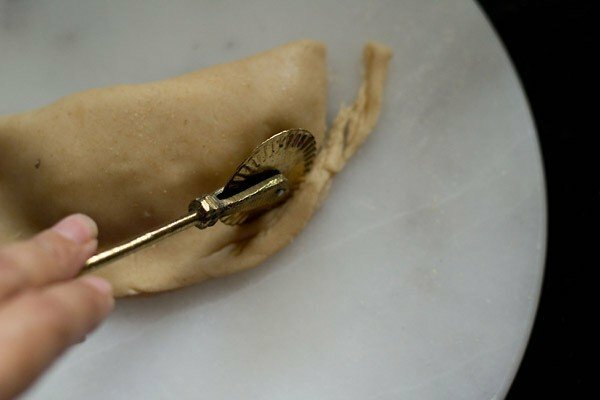 when doing this method, its very important that the gujiya is pressed & sealed well. avoid this method if you plan to fry the gujiya. if baking then method is good. as even if the filling comes out, you don't have to worry as there is no mess. however, its best to make pleated design at the edges. this way the stuffing does not come out while frying and the gujiya look good too. just keep on folding and twisting the edges till the end. prepare gujiya this way and arrange them on a plate or tray. 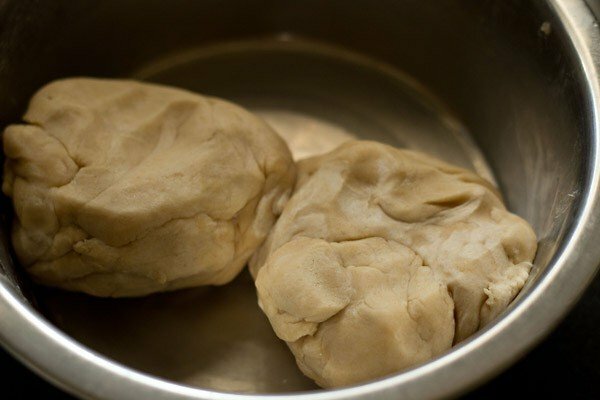 cover the guijya with a moist napkin so that the dough does not dry out. preheat the oven to 200 degrees celsius/390 degree fahrenheit. brush oil or melted ghee n the gujiya evenly all over. 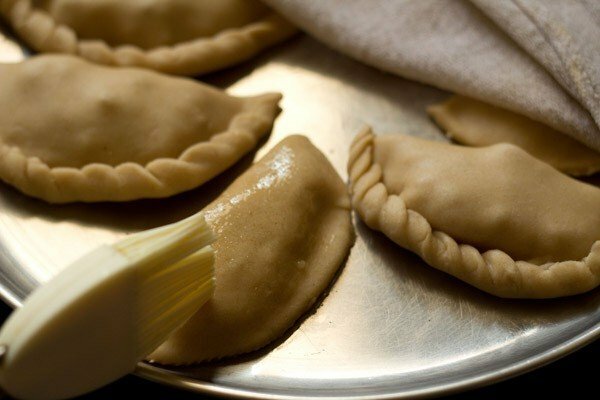 bake the mawa gujiya for 20 to 30 minutes at 200 degrees celsius/390 degree fahrenheit, till they are golden. oven temperatures vary, so do keep a check while baking the gujiya. place them on a wire rack for cooling. once cooled, store the baked gujiya in an air-tight jar or box. first test the temperature of oil, before frying. add a small piece of the dough in the oil. 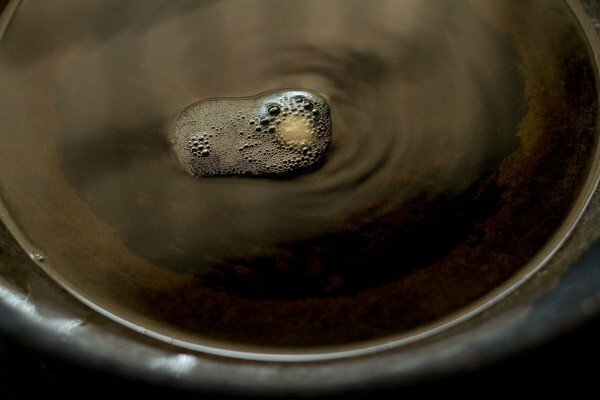 if the dough comes up gradually, then the oil is ready. if the dough sits at the bottom, the oil is still cold. if the piece of dough comes up briskly and quickly, the oil is too hot. gently slid the gujiya in oil. just add a few pieces and don't overcrowd. 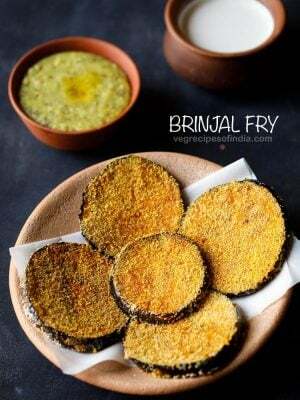 at a time depending on the size of the pan/kadai, you can fry 2 to 3 gujiya at a time. turn them over carefully as fry the other side. deep fry till the gujiya have become golden. drain on kitchen paper tissues. 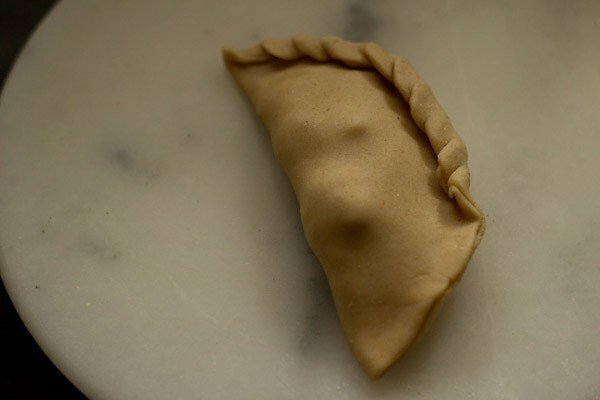 fry gujiya this way and once they are cooled completely, store them in an air-tight box. serve gujiya to your family and guests when required. * if you use all purpose flour, then you will need less water for kneading than what is mentioned. 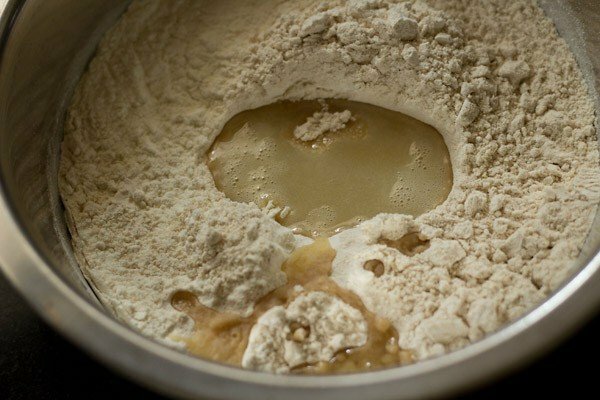 if you use whole wheat flour for kneading, then you will need more water. so add water in parts and accordingly. if the dough appears dry, then add more water and if the dough become sticky, then add more flour. 1. in a bowl take both the whole wheat flour (atta), all purpose flour (maida) and ¼ tsp salt. you can use whole wheat flour and all purpose flour in below combinations as per your choice. overall you need 2 cups of flour + ¼ tsp salt. (1 cup whole wheat flour + 1 cup all purpose flour) OR 2 cups of all purpose flour (maida) OR 2 cups of whole wheat flour (atta). *check notes above in recipe card for using amount of water for kneading dough. 2. heat 2 tbsp ghee in a small pan or bowl. 5. then add ⅓ to ½ cup water in parts and begin to knead. 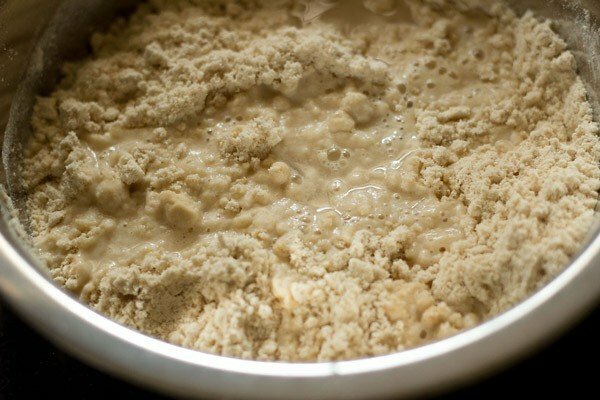 the amount of water needed will depend on the quality and texture of flour. 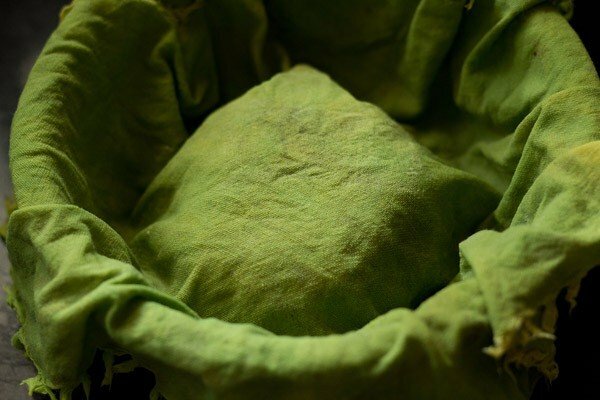 7. cover with a moist cloth and keep aside for 30 minutes. 8. chop ⅓ cup dry fruits and keep aside. 9. melt ½ tbsp ghee in a pan on a low flame. 10. add 1 cup crumbled or grated khoya. 11. stir the khoya continuously on low heat. 12. cook the khoya till it begins to gather around itself. switch off the flame and keep the pan down. let the khoya stuffing cool down completely. 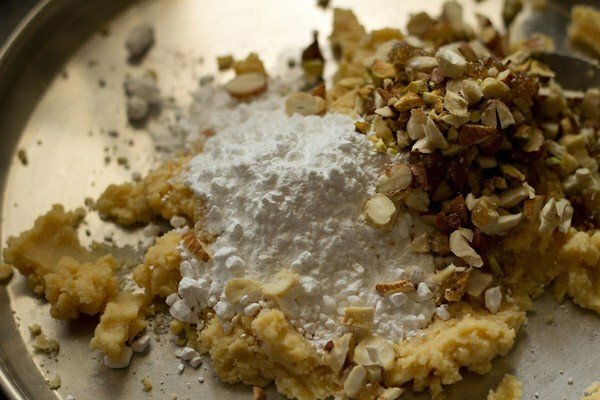 13. add ⅓ cup powdered sugar, chop dry fruits and ½ tsp cardamom powder. better to seive the powdered sugar if there are lumps. mixing is easier. i did not and had to break the lumps manually. 14. mix everything well and keep the stuffing aside. check the taste and add more sugar if you prefer. 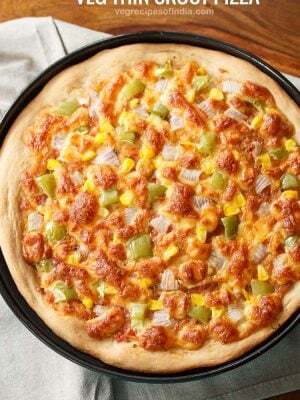 15. divide the dough into two parts. 16. make a medium log of each part and slice it into equal parts. 17. roll each part in your palms to form a ball. prepare the dough balls this way and place them in the same bowl. cover with a moist kitchen towel. 18. dust the rolling board lightly with some flour. roll each ball with the rolling pin to a small circle having 4 to 5 inches diameter. use less flour and if possible you can avoid the flour for dusting completely. 19. with your fingertip, apply water all over the circumference edge. 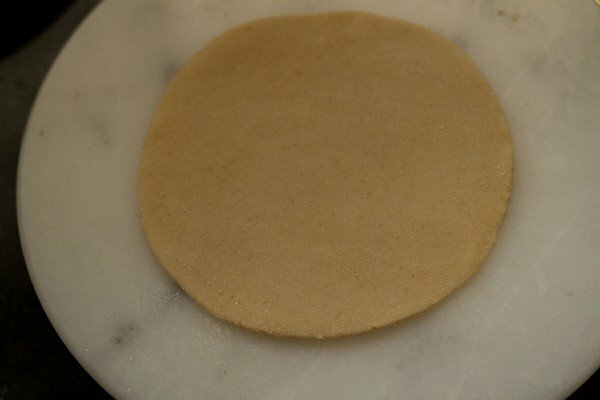 20. place about 1 tbsp or 1.5 tbsp of the khoya filling on one side of the circle, keeping the edges empty. don’t add too much of stuffing as then its difficult to shape them and the gujiya may break in the oil. 21. carefully, bring together both the edges and join. gently press the edges. the edges have to be pressed well, so that the filling does not come out while frying. 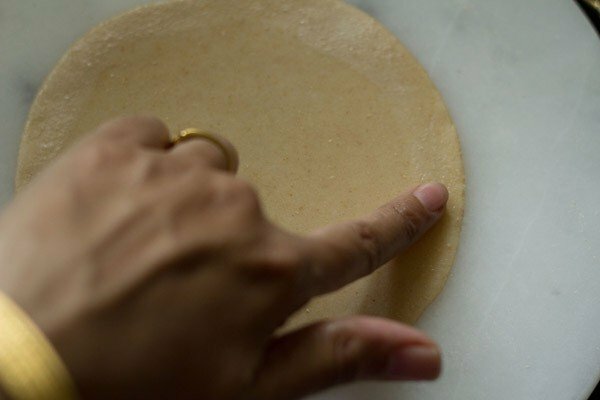 22. with a gujiya/karanji cutter or small pizza cutter, trim the extra edges. when doing this method, its very important that the gujiya is pressed & sealed well. avoid this method if you plan to fry the gujiya. if baking then this method is good. as even if the filling comes out, you don’t have to worry, as there is no mess. 23. the neatly trimmed gujiya pic below. 24. however, its best to make pleated design at the edges. this way the stuffing does not come out while frying and the gujiya look good too. just keep on folding and twisting the edges till the end. 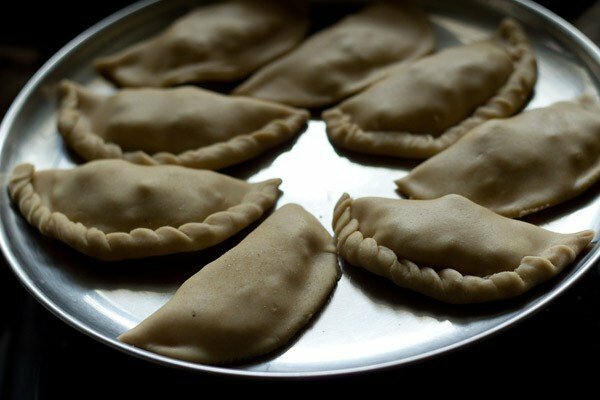 25. prepare gujiya this way and arrange them on a plate or tray. keep the guijya covered with a moist napkin so that the dough does not dry out. 26. preheat the oven to 200 degrees celsius/390 degree fahrenheit. brush oil or melted ghee on the gujiya evenly all over. 27. place them in a baking tray. 28. bake the gujiya for 20 to 30 minutes at 200 degrees celsius/390 degree fahrenheit till they are golden. oven temperatures vary, so do keep a check while baking the gujiya. place them on a wire rack for cooling. once cooled, store the baked gujiya in an air-tight jar or box. 28. heat oil for deep frying in a kadai or pan. first test the temperature of oil, before frying. add a small piece of the dough in the oil. 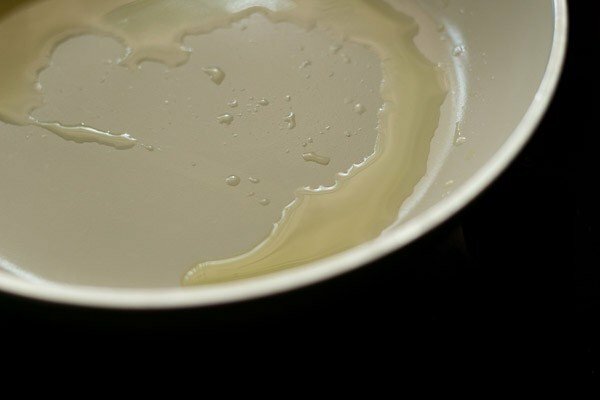 if the dough comes up gradually, then the oil is ready. if the dough sits at the bottom, the oil is still cold. if the piece of dough comes up briskly and quickly, the oil is too hot. 29. gently slid the gujiya in oil. just add a few pieces and don’t overcrowd. depending on the size of the pan/kadai, you can fry 2 to 3 gujiya at a time. 30. turn them over carefully and fry the other side. deep fry them till the gujiya have become golden. 31. drain on kitchen paper tissues. 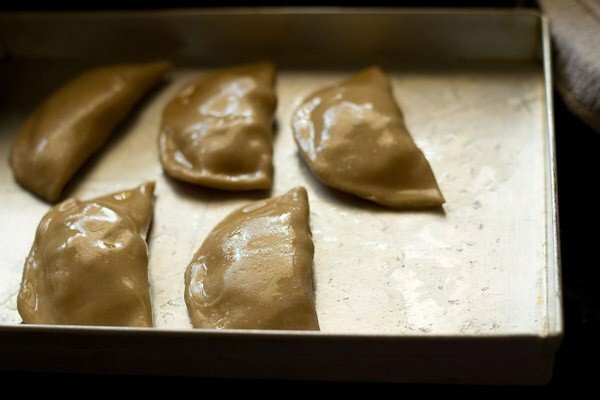 fry gujiya this way and once they are cooled completely, store them in an air-tight box. 32. serve mawa gujiya to your family and guests when required. I have been following your website since long. I’m highly impressed with your knowledge about so many recipes and how you prepare them with so much love! It’s an beautiful art! Your effort of sharing the knowledge makes a huge difference in our lives. My heart felt thanks to you. thank you much vaishnavi. so glad to read your comment and made me feel good too. thanks again and happy cooking. yes you can do this way too tanaya. Hi Dassana, I always check your recipes to clear my doubts especially baking stuff. I tried this one gujiya, they puffed up beautifully and was crispy when it was hot, later they lost their crispness after storing them. Where have I gone wrong? thanks priya. the gujiyas need to cool completely before you store them. if stored when they are slightly hot or even warm then due to moisture released from condensation they will loose their crispness. hope this helps. I made gujiyas for the first time ever last year and followed the recipe to the T. The results were AWESOME !! Perfect gujiya with the perfect amount of sweetness. My toddler loved it. 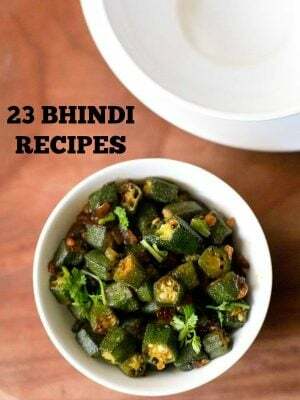 I’m planning to make em for Diwali this year and I had a question, can I double the recipe ? Shud I just add everything twice to make double amount (last year it yielded 30 bite-sized gujiyas) . Also can I half the recipe, like if I want to make smaller batch than the one u mentioned, can I just use half of the ingredients? Thank you in advance !! thank you meA. glad to know. of course the recipe can be halved or doubled. just halve or double the ingredients proportionately. wish you happy diwali in advance. I followed your recipe to the tee including making khoya from scratch. Unfortunately all the gujiyas started to open within a minute while frying. I improvised, took them out of the oil & baked them for 10 mins at 350F. The filling came out of the cracks & caramelized but rest of the structure stood. I don’t know what went wrong, my mom thinks I added too much ghee to the dough or kneeded it too soft or overstuffed the filling. I suspect I waited too long before frying them (waited almost 2 hrs). However I want to thank you Dassana for this & many other recipes. And guess what, we are making another batch later tonight & plan to fry gujiyas within 30 minutes of assembling them. Any advice? Wish me luck! Thanks Ankita. They have not been stuffed properly. If the stuffing is done well then the filling will not come out. Some more ghee in the dough does not lead to the stuffing coming out. I guess the stuffing is too much in the gujiya. Thats why while baking also the stuffing has come out. Do not over stuff the next batch and seal very well. All the best. last year when I try to make gujiya it was not soft as a want and there are small bubble on gujiya.someone plz suggest reason and solution. Iam going to make this year too. bubbles are fine on Gudiya. if you do not want them, then try to cook on a medium flame or medium-low flame. on a high flame bubbles can appear. also do not make the dough too soft. hope this helps. it means whenever ghee is mentioned for moyan we can use desi ghee or refined oil in the same quantity ?and also mam can we use desi ghee in the same quantity of butter for baking cookies and cakes instead of butter ? you can use in the same quantity. 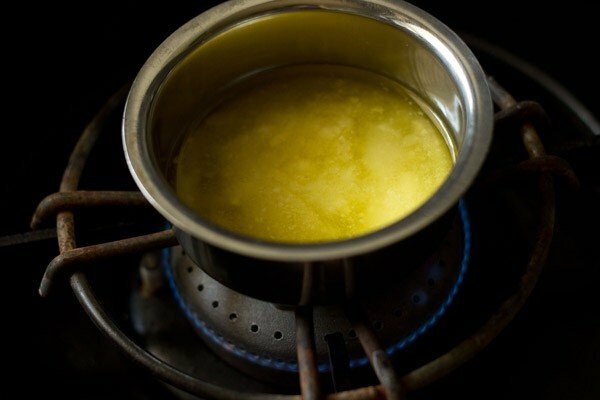 you can even reduce the amount of ghee a bit if oil is used as a moyan. eg if a recipe has 3 tbsp oil as moyan, you can add 2.5 tbsp ghee as moyan. 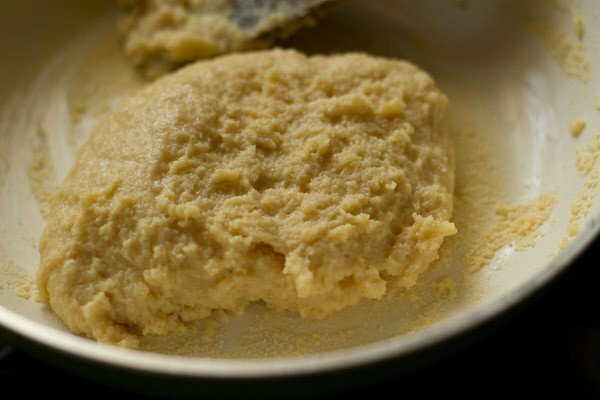 for making cookies and cakes, you can use the same amount of desi ghee as butter. pleased to know this himani 🙂 glad your family liked the mathru and gujias recipe from our blog. thankyou for your kind words and you are welcome. not at all shuchi. feel free to ask your queries. both ghee and vanaspati can be used as moyan. i avoid vanaspati as its hydrogenated vegetable fat and not good at all for the body. you can read more or hydrogenated vegetable fats and oil on the internet. could be water is the reason. more water or less water can also change the texture of the crust. 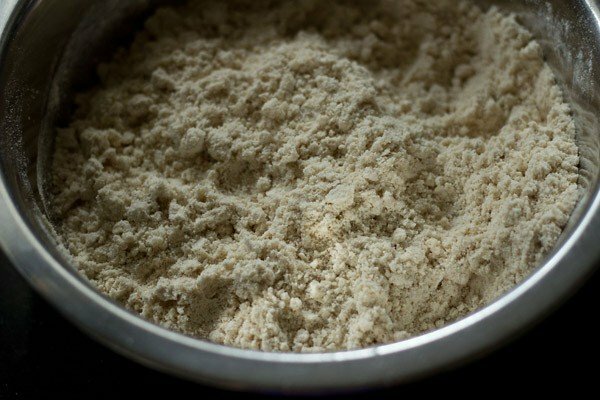 mam i made gujhia as per your recipe but the outer part of gujhia was so crust like papdis i think the quantity of moyan you mentioned is less…to make soft outer part what quantity should be used of moyan? 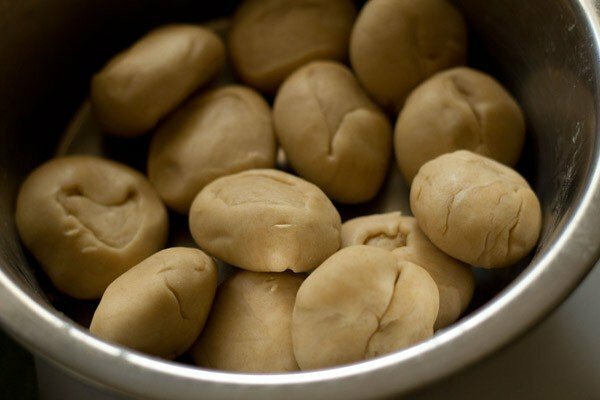 shuchi, the quantity of moyan is enough for 2 cups flour in a gujiya recipe. too much of moyan can make the crust soft or too flaky. i feel some more water needed to be added in the dough. could be due to this reason that the crust was papdi like. at the most you increase the moyan to 3 to 4 tbsp. but here the crust will be more like the crust of samosa. 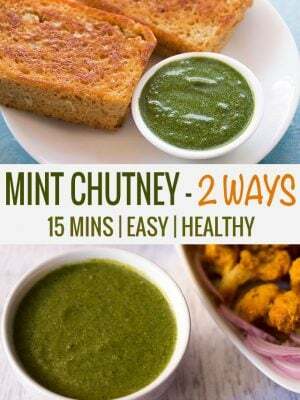 if you are fine with it, then add 3 to 4 tbsp of ghee. 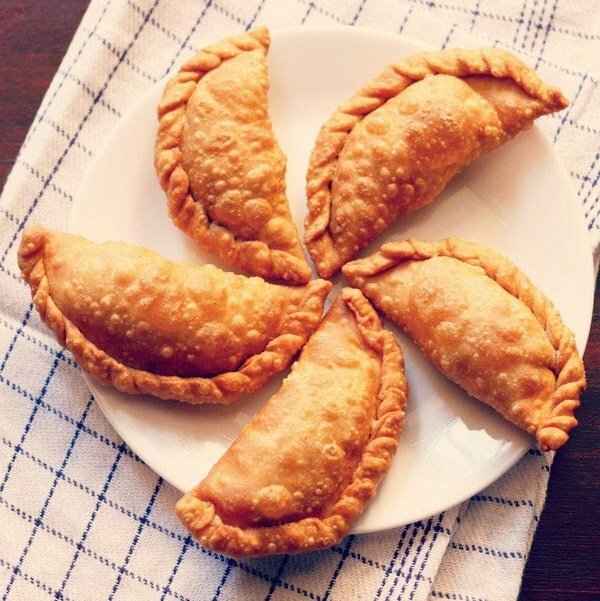 have a look at this karanji recipe (similar to gujiyas) too. same amount of moyan has been used. mam is the same quantity of single acting baking powder and double acting baking powder to be used ?and if we cant find aluminium free baking powder then what quantity of baking powder having aluminium has to be used ? shuchi, i do not know about single acting and double acting baking powder. in india, we do not get these ones. if you do not get aluminium free baking powder, then use the same quantity of regular baking powder as mentioned in any recipe. Hi mam,in some of your recipes you have mentioned only to gather the dough not to kneading that here i wanna know what is the differnce in between these two things and also tell me which brand of baking powder you use as mine has sodium aluminum sulfate which makes my recipe some bitter…and warm wishes for holi …..
shuchi, wishing you too a great holi. 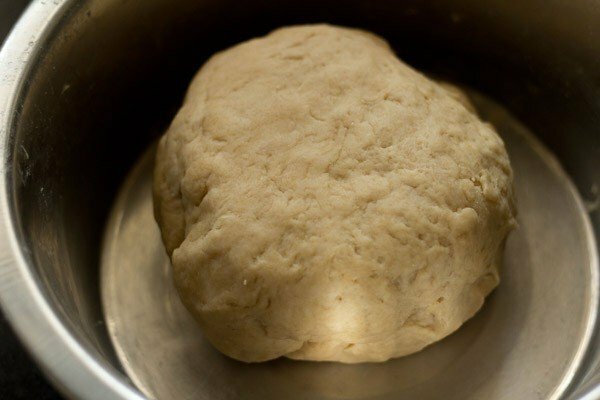 kneading the dough helps to give an even round shape while rolling the dough balls. there won’t be any cracked or jagged edges when rolled. 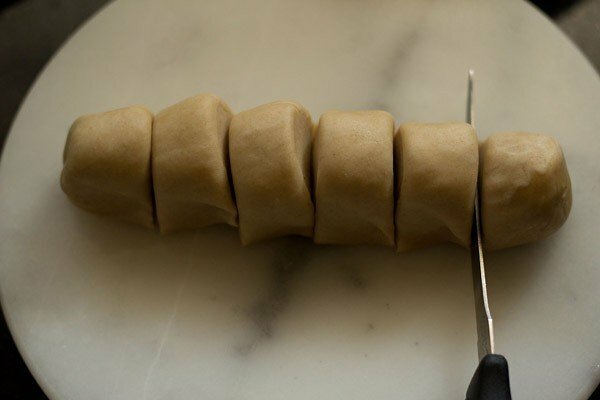 while making gujiya, the edges need to be smooth or else it becomes difficult to shape them. i use aluminium free baking powder. the link is given below. this baking powder is aluminum free as well as gluten free. It has been quite long time I am following your recipes. They are awesome. I have tried many of them including this one. And the way you describe the recipe is commendable. I have heard that after frying the gujiya they dip in sugar syrup for sometime. Have you tried this way? If yes tgen would love to know the stepwise process. Thanks. All the best. thanks a lot purvi. yes the gujiya is dipped in sugar syrup. i do not make it this way as i feel its too much sugary and sweet. i have tasted this gujiya too. after you are done frying the gujiyas, let them cool down completely. then prepare sugar syrup with 1 string consistency. dip the gujiya and coat it with the sugar syrup. place them on a plate. you can take 1/2 cup sugar and add 1/2 to 2/3 cup water for this recipe. Tried the baked version, and results are awesome, I also added some grated coconut in stuffing. I have fried gujiya for lots of times, but baked for the first time. Baked once are equally good n delicious. I may never fry my gujiya afterwards. 🙂 Thank you very much. welcome rasika. nice to know this. thanks for sharing your positive feedback. 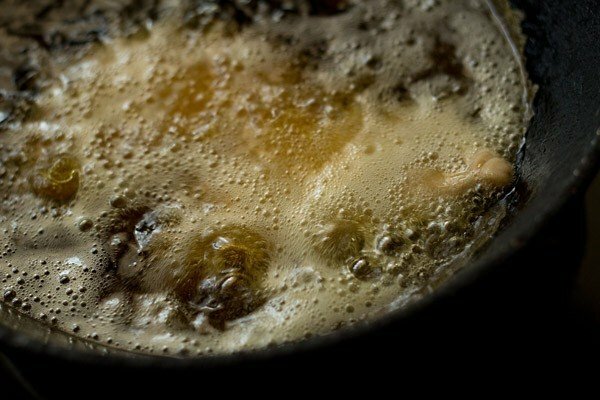 Can I add sugar instead of powdered sugar? nitay, if you add sugar then add it when you add khoya. so that the sugar melts while heating khoya. otherwise sugar particle will come in the mouth. Tried the fried version with all purpose flour… The result brought tears to my eyes. It’s unbelievable that a terrible cook like me could make something so delicious. Your step by step pics are very very helpful. Thanks a ton ! 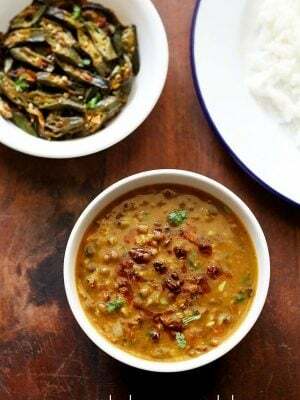 This recipe is also very popular in Andhra. It is made on many festive occasions like Diwali, Pongal etc. 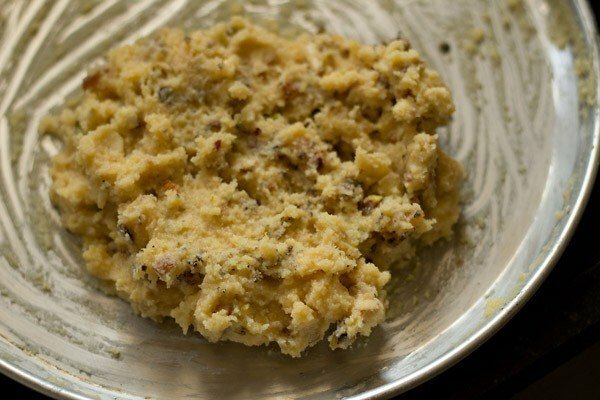 However, in Andhra, khoya with nuts is not used as stuffing. 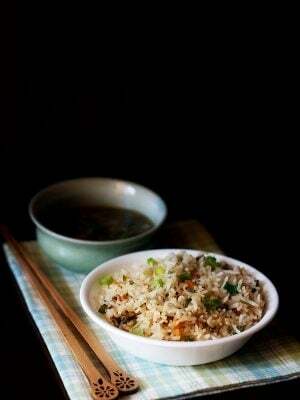 The stuffing is usually made by using coconut and either brown sugar or white sugar. Coconut is dry cooked along with brown sugar (jaggery) or white sugar till it becomes a sticky viscous solid. Then it is stuffed in the shell made with the flours you described. Semi tender grated coconut is required for this preparation. These are called ‘Kajji Kayalu’ Just wanted to let you know, in case you are not familiar with this. thanks rom for sharing this info. i was not familiar about this recipe. good you shared the recipe.